FIRST-HALF goals from Matt Paterson and Andreas Robinson set a revitalised Hawks on their way to a precious 2-1 National League win against Boreham Wood at Meadow Park. 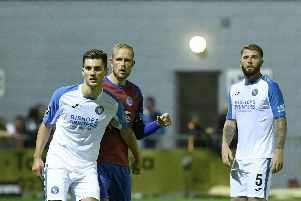 Though the home side reduced the arrears on 70 minutes before Hassan Jalloh sealed the win in stoppage-time after Alfie Rutherford saw his spot-kick saved. The Hawks included three new faces in their starting line-up. Jack James was handed his debut after arriving from Luton Town on loan. Chris Robertson, on loan from Swindon, also made his bow in defence, while Matt Paterson starting up front having arrived back for a second spell at the club. On eight minutes Wes Fogden missed from six yards – but within a minute the visitors were in front. James delivered a good cross which fell to the unmarked PATERSON who easily tapped the ball home. The brilliant start continued on 17 minutes following a foul on Fogden just outside the home penalty area. Andreas ROBINSON curled a superb free-kick over the wall past the despairing dive of the goalkeeper and into the top corner of the net. There was a let off for the Hawks when Ricky Shakes had his shot blocked on the goal line by one of his own players. Defender Jordan Rose replaced midfielder Chris Paul for the visitors at the start of the second half. The Hawks had to soak up some early pressure as the hosts looked to get a foothold in the game. An aimless scrappy spell followed with neither side able to impose themselves. Hassan Jalloh took the place of a limping Paterson midway through the second period. On 70 minutes the home side pulled a goal back following an error from goalkeeper Ben Dudzinski, with Idris KANU capitalising. Yet he Hawks were gifted a penalty but Rutherford's spot-kick was saved. JALLOH latched onto the rebound to knock the ball into the net, though.